Goody gumdrops, have I got a project for you today. I've been wanting to do something with adhesive magnetic sheets for awhile, but have been waiting for the right stamp/die combo to come my way. It did with Shape It Snowman. So, for any of you with pre-school to young elementary age kids in your life--whether your own or those that you borrow from time to time--here's a fun holiday project to make for them. What kid wouldn't love to dress up their own snowmen? And with a card and storage case thrown in, the adults will get a kick out of it as well. For up, let's see everything all together. 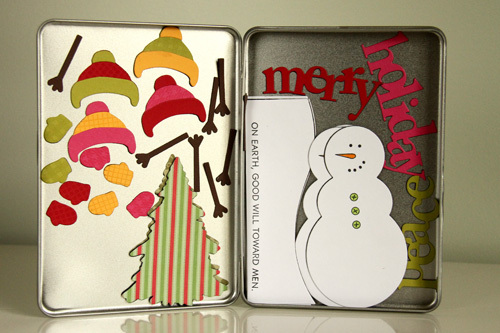 I used Nichole's new 2011 Holiday Tags to tie the tin and card together visually. The "Let It Snow" tag in particular has an open hexagon pattern on it, just perfect for coloring with Copics. Next up, a photo of the card. Adore adding felt to the snowman. Warm and cozy. 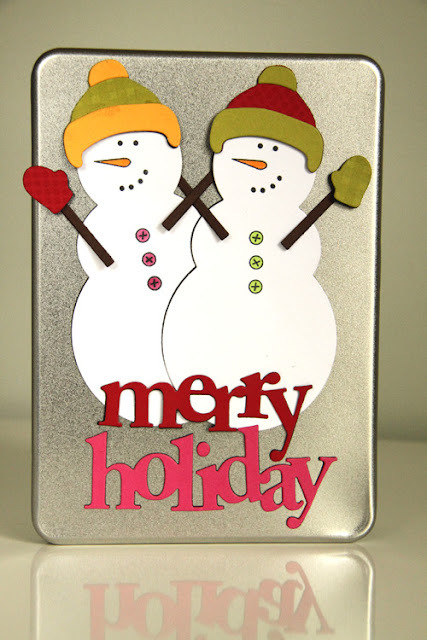 I have a sentiment from Wonderful Words: Holiday stamps and dies there for some visual interest. A close up of my storage case. 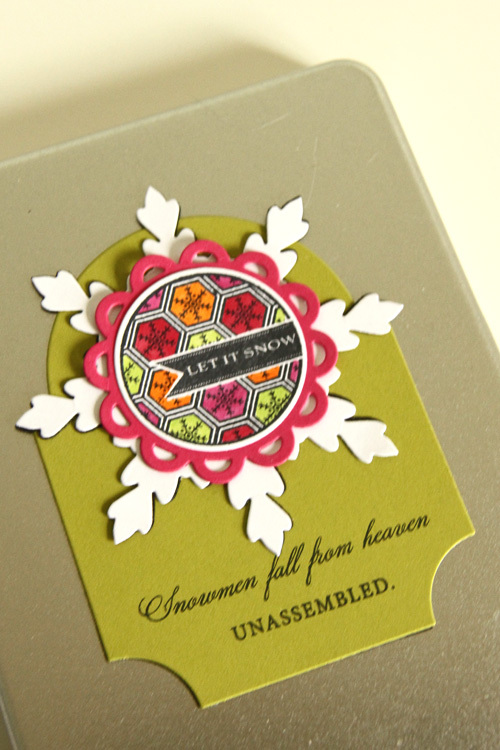 Mega Mat Stack 3, a tag/snowflake combo that matches the one of the card, and sentiment from Made of Snow. There is also a sentiment from the new In the Meadow set that works as well--"In the Meadow, We Can Build a Snowman". You know, if you just need an extra little nudge in that direction:). All the elements on the cover of this metal DVD case are first die cut out of adhesive magnet sheeting and covered with another die cut out of cardstock. They stick to the front, but are removable. That will factor in here in a moment. Open up the case and you have all the elements of a good time. You have magnetic snowmen, snow slopes, hats, gloves, words, arms, and trees. Again, everything is cut twice--once out of adhesive magnetic sheets and again out of cardstock. As a space saver, the shapes magnetize to each other and are stackable. See my trees there? I think I have a total of four, one on top of the other. Now, upon receiving this gift, the lucky child can get right to work arranging his/her snow scene on the front of the tin. It's the storage, gift wrap, and play surface all in one. Another example. 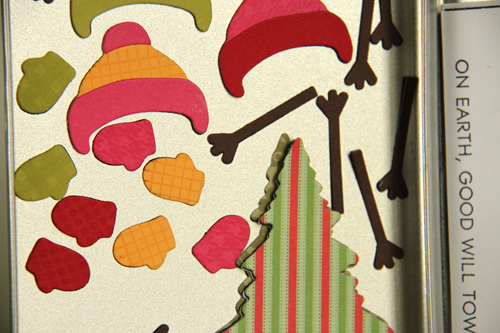 With Wonderful Words: Holiday and the dies, finding the proper arrangement of words (or making up new ones) is a great activity for a new reader. And another example. Why not turn the tin 90 degrees for a landscape orientation? And because the snowflake tag from the cover was magnetized as well, it can be thrown in as an additional design element. Of course, there are many other combinations. You could even add in more stamp/die sets for more playtime fun. Let's talk numbers now. You are probably wondering what this project cost to make. I bought a 1x2 foot piece of adhesive magnet sheeting at Michael's for $6 using a coupon and I used every bit of it. The DVD case I had leftover from previous projects. I bought a ton here once upon a time for cheap, but you do have to buy in larger quantities and pay for international shipping from Canada. Might be worth it for you. Or, browsing through the aisle of Michael's today, I saw some other options in the form of tins and lunch boxes. With a coupon, probably around $3. So a $9 homemade gift. A little on the high side, I'll admit, but worth it for that special little someone. This one is headed over to England for my niece and nephew in a few months. I can imagine a hostess sending this project to her little guests to enjoy as they travel to her house to spend the holidays. Or even fun for the neighbor kids. And that, my friends, wraps it up for me this month. I'm off to pay the whip cracking husband some attention. It's a dance party tonight with the new Just Dance 3 in the house. Thank goodness nobody but us witnesses that spectacle! 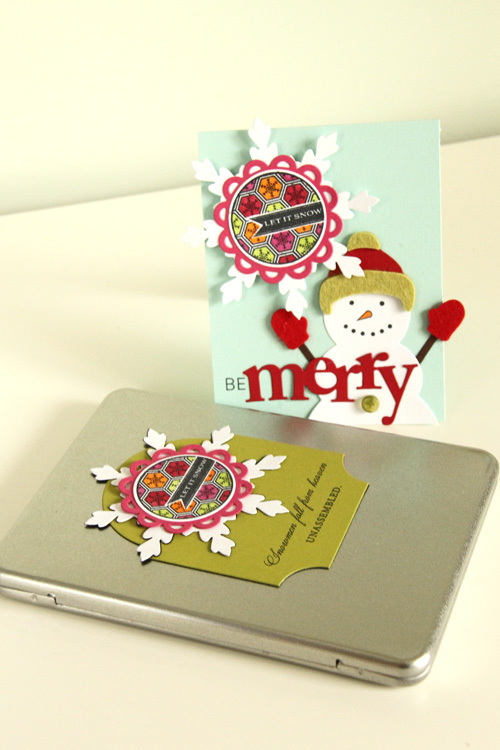 Be sure to blog hop on over to the PTI blogs to see more projects using Wonderful Words: Holiday and 2011 Holiday Tags. It's beginning to look a lot like Christmas! Stop it. That is amazing. P.S. Are you bringing Just Dance 3 to Deb's? I'm in. I just love your project!!! What a FANTASTIC project!!!! LOVE this idea, Erin!!!!! So creative and super fun!! What a wonderful card, and a FANTASTIC magnet play set!!! Wish my kids were still young to play with that!! What a GREAT idea! Love it! Love it! Love it! LOVE, LOVE, LOVE, LOVE, LOVE (how many times can I write love?) this! Seriously. I'm sold. I must purchase all of these things now. I'll tell my husband to blame you. ;) Thanks for bringing a giant smile to my face and soon-to-be smiles from my son and nieces and nephews. SUPER CUTE!! (= Love that great snowman!!! Oh, what an amazing idea!!!!! I wouldn't give it away, but play with it myself, hi hi! Would make great decoration!! This is such a fun project. My 'littlest one' in my house is now 18, and my niece is 10, so I don't have any little ones for this, but believe it or not, I want to play with this myself. I love your idea of having this on-hand for kidlets that visit. I just may have to get that snowman die to put this together. I should have stopped after reading the first line ....... seriously ADORABLE!!! You know I have a few of these from Pottery Barn Kids and always thought I can make that but like you the right set never came along UNTIL THIS POST ~~ you always get me right in the sweet spot with your creativity that is FOR SURE!!! This is such a great idea, Erin! Thanks for sharing. this is such a fun idea, I love it!! I get such a kick out of your cleverness! You must be so fun to hang out with! Thanks again for your brilliant creativity and inspiration!!!! 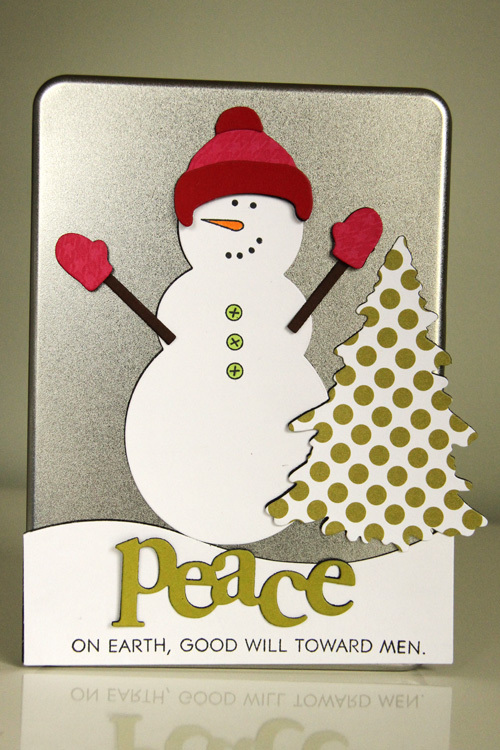 Really adorable idea, magnetic snowman paper dolls. I already thought I wanted this set, but now it is a must. Wow!! I want to play with your magnetic build a snowman set!! VERY cute and creative!! So Cool! I have to make 9 !!! Thanks for the lovely idea. Love the idea of using magnet sheets. Great project Erin! Oh my goodness! What a fabulous idea!! Amazing idea Erin! I love how it turned out, so cute! Finally, being Canadian is paying off - cheap DVD cases, who knew? Oh. My. WORD! Erin, you clever, clever girl! Love this project! How ADORABLE is this?! Well, duh -- VERY ADORABLE! I want to play & I'm "old" -- LOL!!! Hope when I'm lucky enough to have grands that I can remember to make these for them!!! Too CUTE and creative and a great learning tool, all in one -- LOVE it!!! Absolutely amazing. This is just about the cutest thing I've ever seen. Well, well done! Okay - this is too funny not to share. The authentication letters I had to type in to post my comment - F R O S T. Coincidence or not???? Such a fantastic project!!! This would be a great "quiet book" for church (well, until my child dropped the metal case onto the floor, LOL) Love this, Erin!!! What a fantastic idea! Love it. I can see making this for my nephew who I babysit. We can have it as a display and he can change it whenever he comes over...or he can take it home and do the same thing...so fun! I love this! Such a great alternative to paper dolls. I just know my 2 boys would love this. Super cute idea! My daughter would love one of these! Well, you just made this another PTI HAVE TO HAVE item. Seriourly girl, I love love LOVE your creativness. What a brilliant idea for the season and for kids! Too good! :) You are a great inspiration! Your blog is one of my favorites - I love your projects and your wit. You make me laugh every time. I think this would also be perfect for babysitting bags. I'm going to show it to my daughter to add to hers. Great idea. You could cut family faces out of extra photos and paste them on magnet backing and personalize your snowmen! My grandkids love to play with magnets. Great post!